I mentioned in an earlier post that I'm getting my Masters in social work. This Thursday, I begin a year-long practicum at the Johnson Unit, the inpatient psychiatric wing of the local hospital. I've been looking forward to this opportunity for a long time, and I seriously can't wait! When I stopped by to fill out paperwork last week, my supervisor told me that I would need a portfolio. 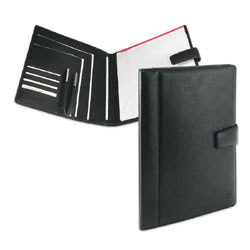 You know, those leather notebooks that hold a legal pad, a pen, and a pocket for your papers. See, the problem is, I think they're hideous (no offense if you have one). I needed to rectify the situation STAT. I tried to find something on Etsy, but no luck and no time for Alchemy. So I went and found the cheapest plastic portfolio I could get my hands on (the options were baby blue or baby pink...yick). It was $4 at the U of O Bookstore. Then I sewed a cover for it using some cute Amy Butler fabric from my stash. Just hemmed the fabric, nothing fancy. The trickiest part was figuring out how to attach the fabric to the folder. I wound up using superglue because it was what we had around. It made some small stains on the fabric, but they're not too noticeable. The inside's still blue, but no one said I was a miracle worker. I'm so happy with how it came out-- I much prefer it to black leather! Wish me luck as I break it in tomorrow! p.s. I don't think I've showed you the little pincushion I made a while back. I heart it! Love it! make me one! Wheres the link to the photog's site with all of the wedding pics? my mom wants to see them (i'm pretty sure I already showed them to her but shes claiming no)Chag Sameach!